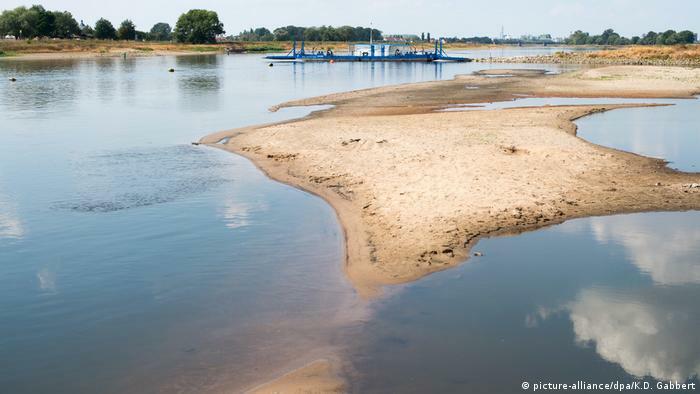 World War II munitions have been found in numerous places in the Elbe River in the eastern German states of Saxony-Anhalt and Saxony, according to police. So far 22 grenades, mines or other explosives have been found in the Elbe this year, Saxony-Anhalt police spokeswoman Grit Merker told DW. "We ascribe that to the low water level. That's pretty clear," she said. In most cases, people contact the police after happening upon the bombs, which mainly stem from World War II, Merker said. Weapons disposal experts are then sent in to examine the discovery, which sometimes turns out to be an old gas container or fire extinguisher. If the explosives can't be transported, they are detonated on site, which is less often the case, Merker said. Experts detonated two anti-tank mines found in the Elbe in Saxony last Saturday. After more than 70 years embedded in the riverbanks or riverbed, the bombs tend to have corroded and been covered with a thick crust of sediment. That makes it unlikely they will simply explode. Even so, police have appealed to people not to touch the explosives but rather to notify them immediately. "Today there was a photo in a newspaper of someone holding up pieces in their hands," Saxony police spokeswoman Wibke Sperling said. "That is a classic example of what gives weapons disposal experts a fright." Bomb finds are a relatively frequent occurrence in Germany. Merker was blasé about the recent discoveries. "I don't think people from the weapons disposal service find it a glaring anomaly," she said. After World War II many explosives were disposed of by being dumped into the Elbe, which flows from the Krkonose Mountains in the Czech Republic near the border with Poland to Hamburg in Germany's north.